From 1925, this page from Popular Science Monthly describes to the average Joe what life might be like in the 1950s, the main focus for this article being the problem of congestion. 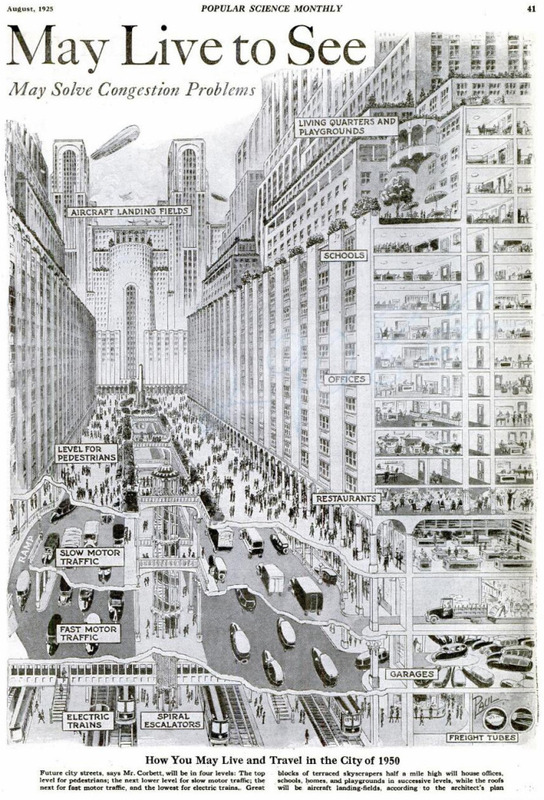 What they seemed to come up with as a solution was the theory of 4 street levels: the top for pedestrians, 2nd for slow motor traffic, the 3rd for fast motor traffic and the last for electric trains. Not only that, but buildings would also operate using this leveled system going by housing, offices, schools etc. Though, my favorite level would have to be the ‘aircraft landing fields’. The diagram’s pretty self explanatory so see for yourself. Unfortunately it seems that 1925 was a little too ambitious.